These were frightening words to a lot of people. With no definitive start date for service, how do we know NJT isn’t going to just shut down the whole line entirely? Well, I think there’s nothing to worry about – it will open up again eventually. But while it is closed, let’s take a look at the line as a whole and discuss its pros and cons. What was good about it, and what can be improved when it opens up again? 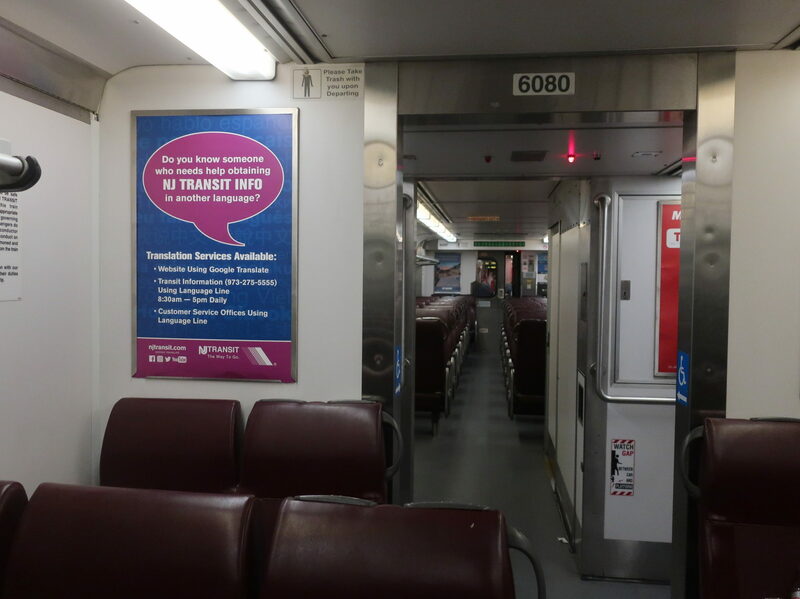 For those who don’t know, the Atlantic City Line is New Jersey Transit’s only commuter rail line in South Jersey, and the only one that doesn’t go to New York. It begins at Philadelphia’s 30th Street Station and, by way of many different environments and towns, ends up “down the shore” at Atlantic City Station. A few friends and I rode the line on the last weekend of service, and it was one of the most dynamic and interesting commuter rail lines I’ve ever ridden. Coming from UPenn, I’m within reasonable walking distance of 30th Street Station, which is a good thing, since that’s the only Philadelphia station that the AC Line leaves from. This is already a turnoff for some people – of the three main stations in Philly, 30th Street is the least central. Of course, it’s also the only place in Philly that Amtrak stops, and that gets a ton of riders, so clearly people are willing to use the hub. The AC Line’s diesel trains couldn’t go down into the Regional Rail tunnel through Philly, anyway. Speaking of Amtrak, the AC Line actually boards from the beautiful Amtrak section of 30th Street. Once the awesome flip board displayed our train’s track number, we headed down to the lower level of the station. The train arrived, bell ringing, a few minutes later. This train was one of twelve that would operate every day. There’s really no rhyme or reason to the schedule, with gaps as short as 50 minutes or as long as 3 and a half hours. The nature of the line is interesting, too – it has very few rush hour trips to and from Philadelphia, and demand runs in both directions. Some people definitely use the line to commute, but a ton of leisure riders use it too. Let’s also talk about the fares, because they’re interesting. 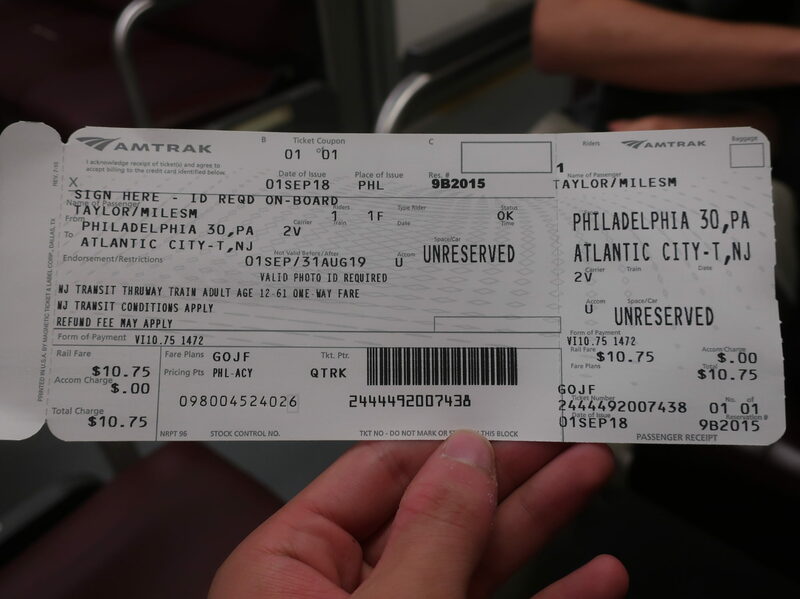 A full trip from Philadelphia to Atlantic City costs $10.75 – a lot to ask, but expected for NJT. The thing is, though, if you take PATCO to Lindenwold and hop on the train from there, it will only cost you $8.25, including the $3 PATCO fare. “But Miles, surely that takes longer!” NO. As you’ll soon see, even with the transfer time, that itinerary gets you to Philadelphia faster than the train, plus you end up right in Center City instead of at 30th Street! Incidentally, the cheapest journey you could make on the AC Line is between the last two stops, Absecon and Atlantic City, and it costs just a buck fifty. A monthly pass for that journey is a mere $44! I bought my ticket through Amtrak. Because why not? That was something you could do. But that’s the route we had to use, so we were going to use it. It takes over 20 minutes just to get to the first stop, and during that time, you’re just chugging along past vacant apartments and huge old industrial buildings. There’s one bit where the track runs under the El and you think “Oh, why can’t there just be a transfer here?” when you see the Market Frankford Line flying above. Finally, the track rises onto the disgusting old Delair Bridge over the Delaware River. There seems to always be something wrong with this bridge when it opens for boats, and whenever something goes wrong, train service is instantly terminated. 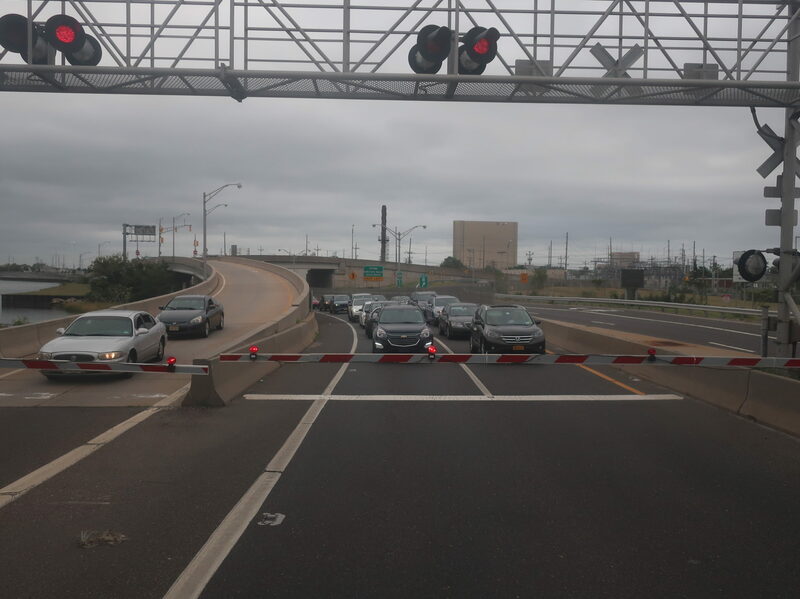 I had actually planned to ride the AC Line once before, but nope, the bridge was stuck open. No trains! I hope they make some improvements on this rusting piece of junk while the line is closed, but it doesn’t seem like that’s planned. Granted, that is an awesome view. The Pennsauken Transit Center station is right after the bridge. This is a newer station, built to facilitate transfers to the River LINE light rail service. After that and a short industrial section, you’re travelling through suburbia for a while. In fact, Cherry Hill Station is located right behind a shopping plaza! Also, we saw the 340 rail replacement bus here for some reason. Uh…NJT, trains were still operating at this point! 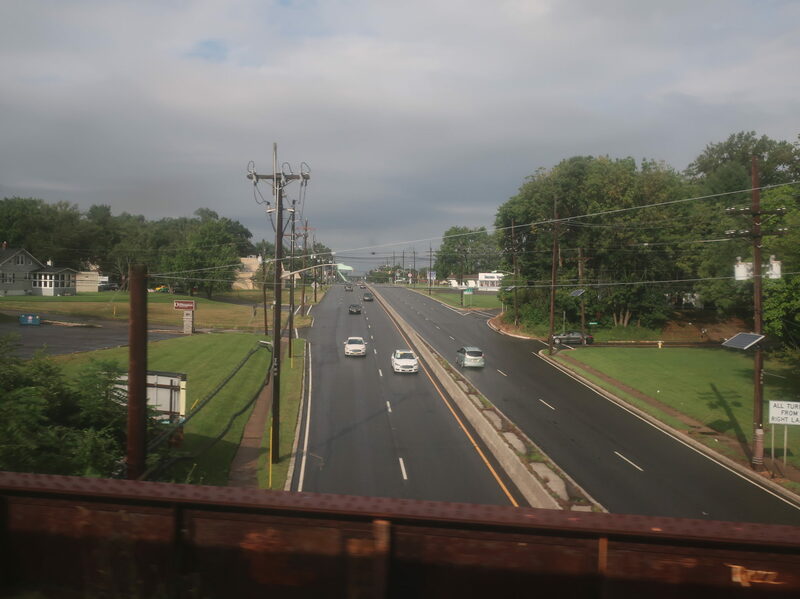 Just east of Westmont, the line joins up with PATCO and they run together until Lindenwold. The sad thing is that on the way back, we ended up next to a PATCO train, and even making stops…PATCO was still faster. I guess they don’t call it the “speedline” for nothing. The parking lot hellscape of Lindenwold was our next stop, and from there, it would be just the AC Line again. 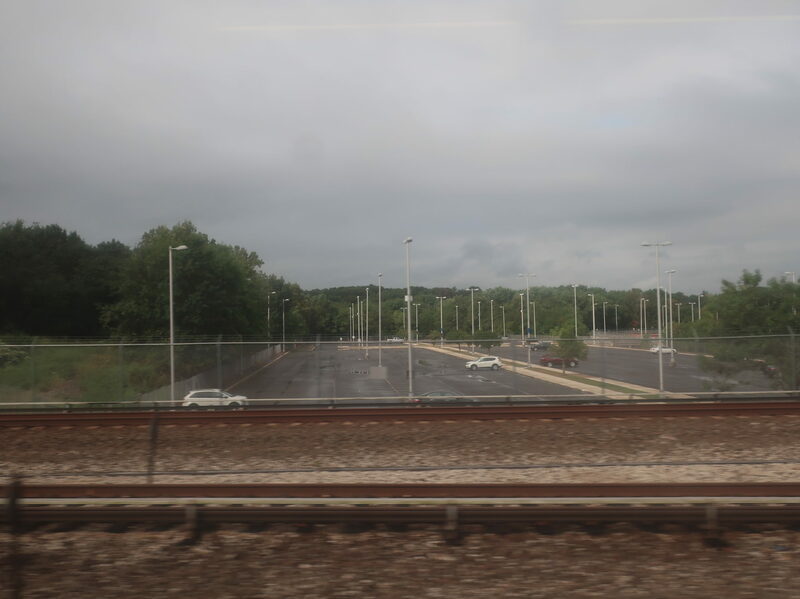 One of PATCO’s many parking lots. The scenery isn’t too different after Lindenwold – just more suburban residential areas and some bits of forest. Soon after crossing a road with some businesses and parking lots, we went by the old Berlin Station, now just sitting unused in the middle of a neighborhood. 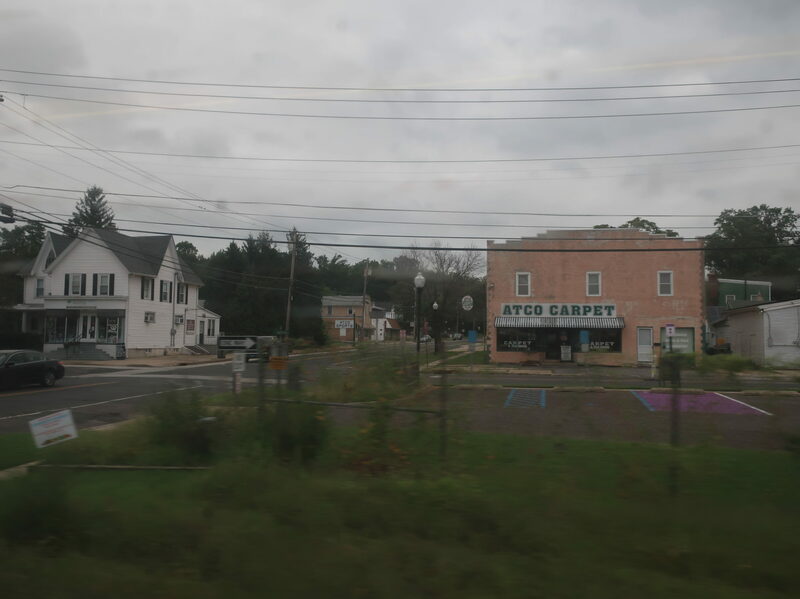 Instead, we stopped at Atco, a station whose surroundings consist of: a parking lot, woods, a motel, woods, a mobile home manufacturer, woods, and also woods. About a mile east from the station was downtown Atco, which I guess didn’t have enough room for a parking lot to “justify” putting the station there. It was a pretty barren downtown, admittedly. There’s not much to report for the section past Atco. For a while, the train just runs through the forest, occasionally going parallel to streets in increasingly rural residential neighborhoods. Interestingly, the streets it parallels are always called Atlantic Ave. Maybe there was a continuous road at some point? We also passed occasional tracts of farmland. Here is one of them! Those farms marked the beginning of what I call the “Nebraska” section of the line. Its characteristics include flat land, the aforementioned farms, and the town of Hammonton, which feels like it was pulled straight out of the midwest. 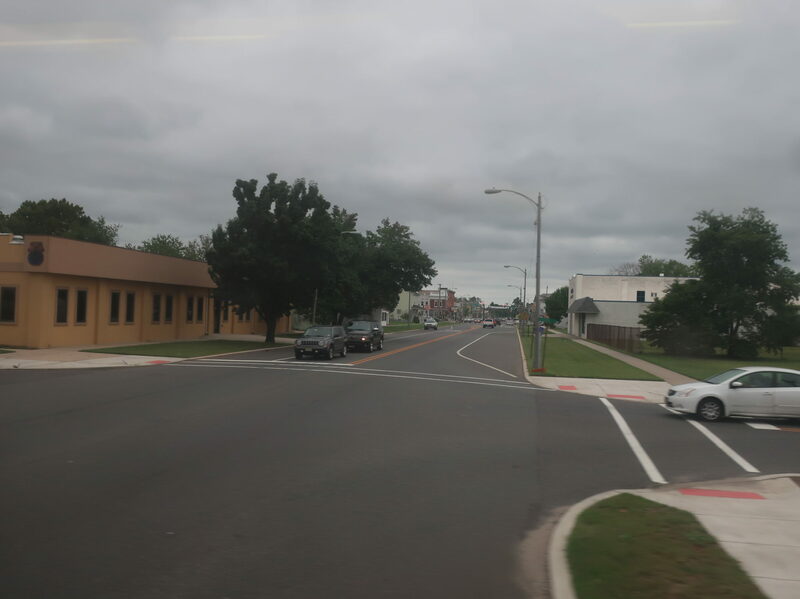 About half a mile east of the downtown is Hammonton Station, which was built with a long, skinny parking lot alongside it. There’s an industrial section after Hammonton, but that doesn’t mean the scenery is boring. Indeed, we went by a bunch of dangerous-looking vehicles stored behind a National Guard office, and that was right after passing a statue factory with a huge lot of its goods on display! 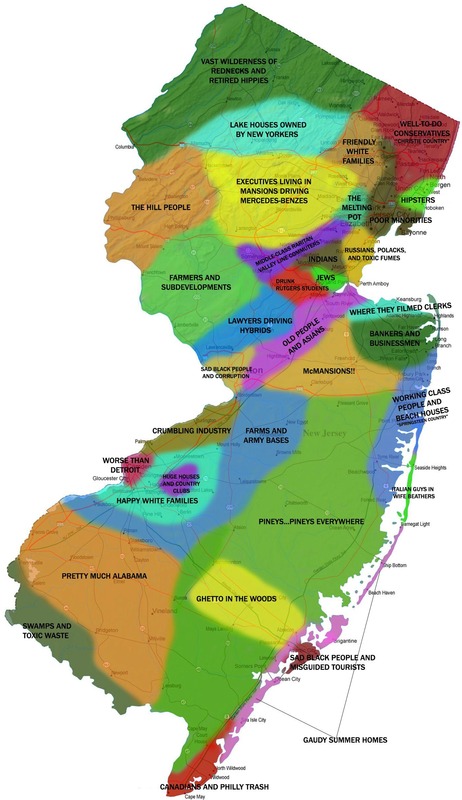 From that point, the scenery can best be described by what this infamous map of New Jersey calls it: “ghetto in the woods”. Yeah…that’s pretty accurate. 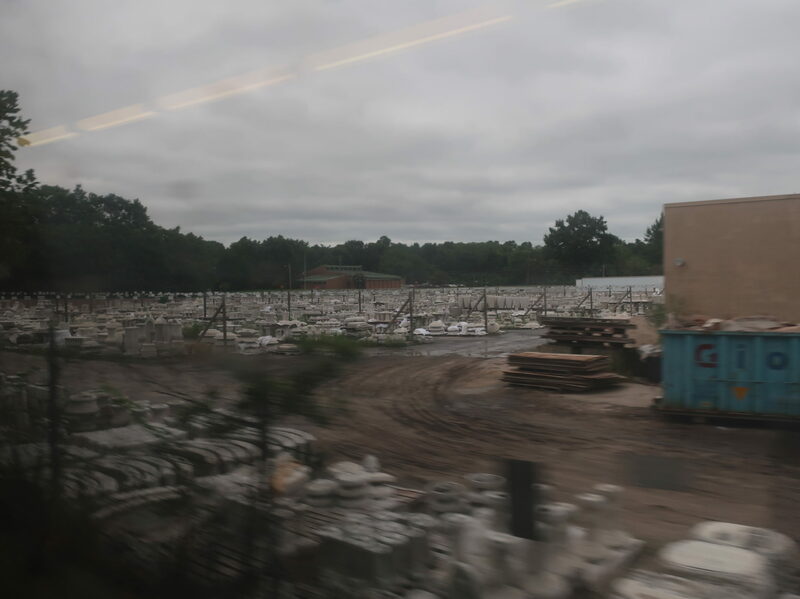 The track is on a complete and utter straightaway for a while, including for the next stop, which has to be one of my favorite train station names ever: Egg Harbor City. 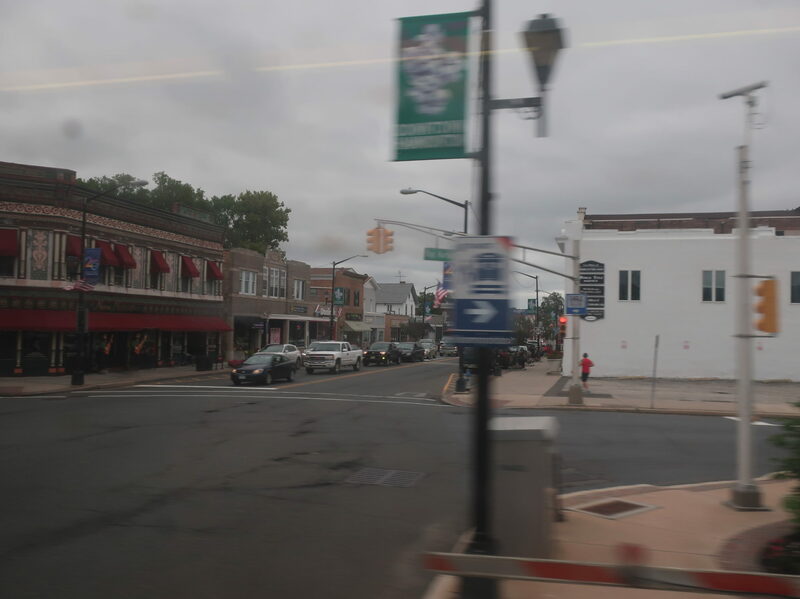 Despite the promising title, though, the town is unremarkable, and it’s gone soon after departing the stop. There was a long stretch of forest from there, broken only by a panoramic view of the Atlantic City International Airport, and later on, the city’s reservoir. Downtown Egg Harbor City is down this road. There’s not much there. Civilization was reached in the form of suburban development along White Horse Pike. About when that started to appear, we made our second-to-last stop, Absecon. Again, there wasn’t much to see here. The station did mark the end of the seemingly endless straightaway, and we started to curve south after our stop. Woods continued until suddenly, we broke out into a vast expanse of marshland. 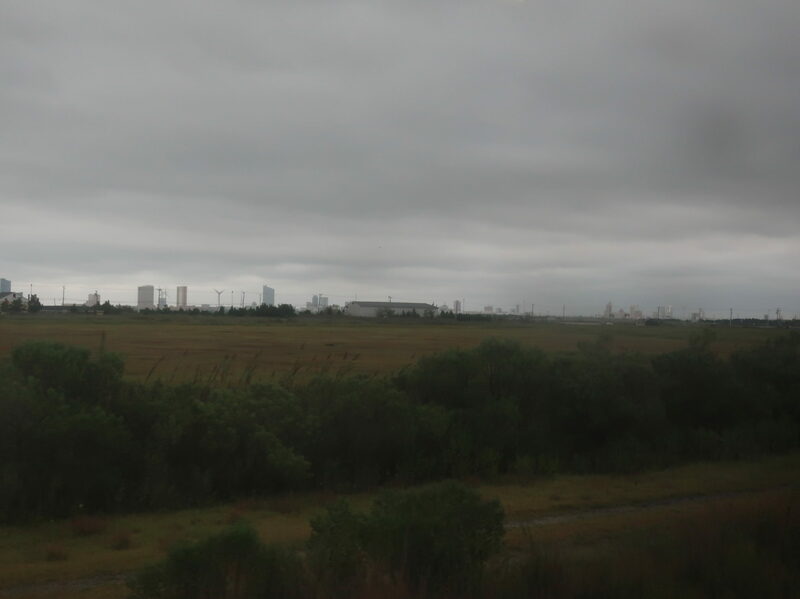 The Atlantic City skyline was constantly in view as we sped over the flat plains. The track came up next to the Atlantic City Expressway, and we started to slow down. We crawled over the swing bridge that crosses over a river, and right after that is a level crossing with essentially a highway. Finally, right after that, we arrived at the Atlantic City train station. Yeah, let’s just stop an entire highway! So that’s the train ride. Or, I guess, that was the train ride. You can see why this is a desirable way to get down the shore: the train is comfortable, and there’s a ton to see during the trip. However, now that the train isn’t running, the alternative options of getting to Atlantic City have taken the spotlight. Let’s look at those. A train sitting at Atlantic City. There are a number of buses that are redundant to the AC Line, most of which feed into Lindenwold. As far as Atlantic City trips go, the 340 is an express from there to Lindenwold, but that’s only a temporary route for the duration of the closure; the 554, on the other hand, acts as a local alternative to the train, serving every stop and much more. That one has always existed, and it is far slower than riding the rails. 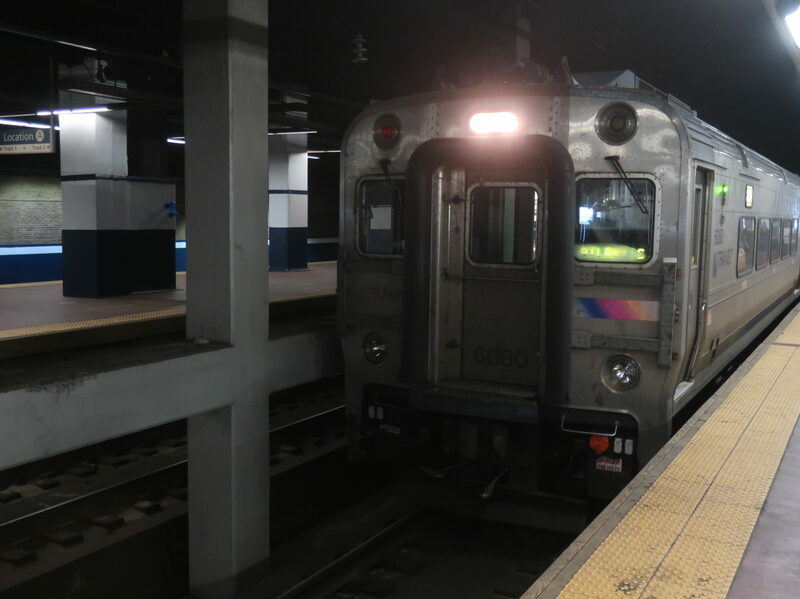 In fact, the train is practically unbeatable from Atlantic City to Lindenwold, and it takes about the same amount of time as driving! I’m more concerned about Lindenwold to Philly, which is over a third of the whole AC Line journey. 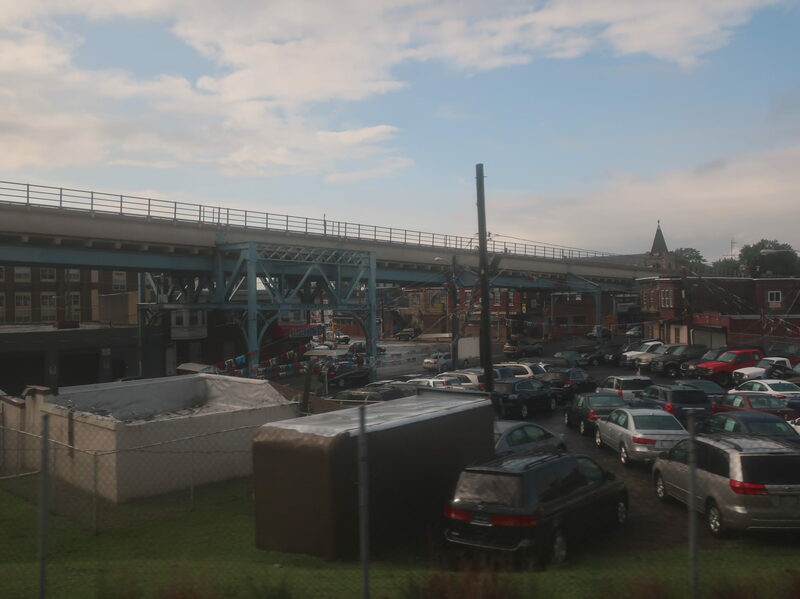 This is where the train is really problematic – when you get to Lindenwold, you think you’re getting close because it’s the end of the PATCO, but there’s still another 40-odd minutes to go before Philly. Like I said before, PATCO is faster than the train from there to Center City. But why not just eliminate the transfer? 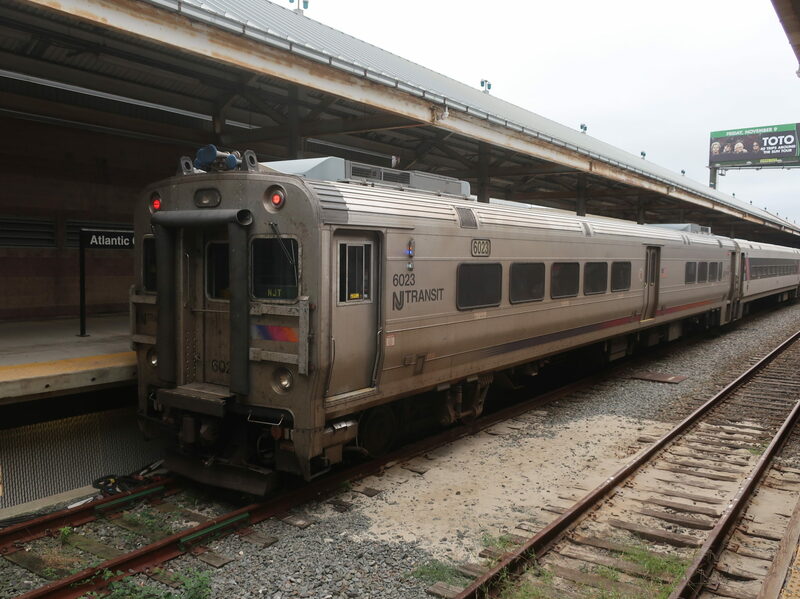 NJT has the bus for you: the 551, which existed before and will exist after the closure, is an express bus from the Philadelphia Greyhound Terminal to the Atlantic City Bus Terminal. Both of those places are closer to their respective towns’ activity centers, and the bus is scheduled to be slightly faster than the train (yes, traffic may change the actual running time)! Where it really beats out the rail line, though, is frequency: the 551 runs every hour or better, plus it runs 24/7 service. Best of all, rail tickets are cross-honored on the 551, so it costs the exact same amount as the train. I think this commuter quote from this article explains it best: “I wouldn’t be surprised if a lot of people (stay with the bus in January), because the train always had delays and stuff like that anyway.” That’s the unfortunate truth: in many ways, the bus is simply better than the train. 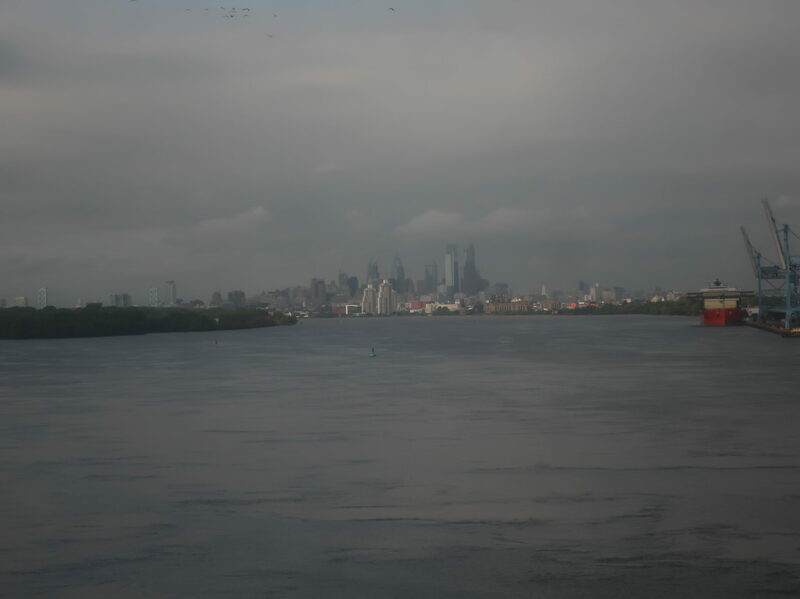 That’s not to say the train is bad, and I really did enjoy my ride, but I see a ton of advantages to using the bus, from frequency and span to not having to use the awful rail bridge over the Delaware River. Still, summer traffic to resort locations is awful. The train ride is a ton of fun. The line truly is speedy from AC to Lindenwold. It’s ultimately up to you how you want to spend your journey to the shore, and hopefully, the choice will be made available once the train opens up again in early 2019. Assuming it opens on schedule. Which it probably won’t. But maybe it will. I dunno. We’ll see.